A guide to how to deliver a new class of flexible, demand-response mobility services. With urban centers experiencing unprecedented growth, challenges confronting city leadership and transit agencies are also creating new opportunities. 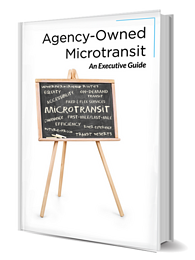 The Agency-Owned Microtransit Executive Guide is a practical look at how flexible transit services are transforming how public transit agencies are reinventing themselves.